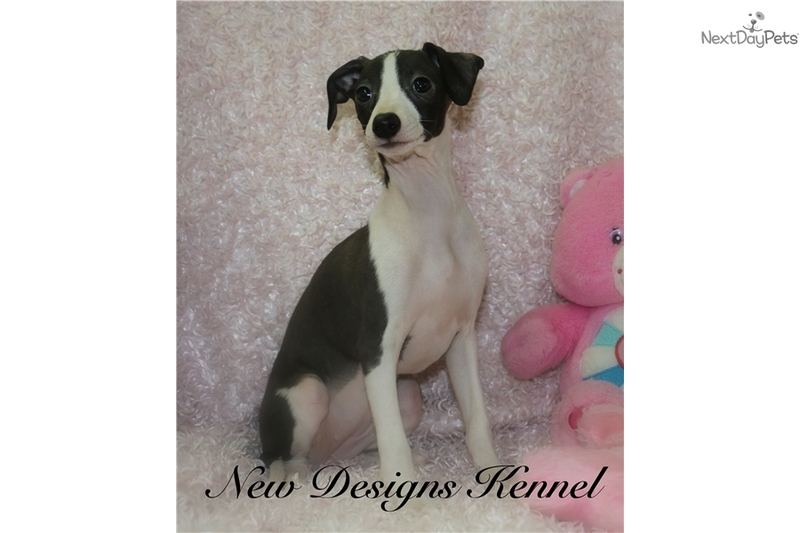 This Italian Greyhound nicknamed Trilby sold and went to a new family. Trilby is the whole package. This stunning seal and white Irish marked girl with perfect markings. She is a wonderful girl with an outgoing personality and a playful temperament. She will make an outstanding pet for any family. Italian greyhounds are so short coated and lack the usual dander of other dogs. Many people find them hypoallergenic. Keeping them groomed and spiffy only requires a damp cloth run over their body. Our puppies all come with full APRI registration, health and genetic guarantee, complete medical history and our vet's certificate of health. They are current and up to date on all age-appropriate vaccinations and de-wormings and all are microchipped for their safety and your peace of mind. We do ship our puppies for $275, which includes airfare, airline approved travel crate (yours to keep) and all necessary interstate shipping paperwork. View the rest and then visit us a www.newdesignskennel.com to see what makes a New Designs Puppy so very, very special!